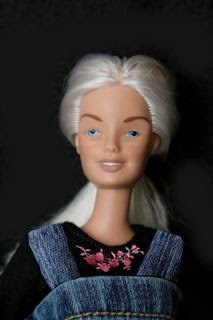 As homeschooling has grown in popularity, there's a Barbie™ to meet every need. The Protestant Christian version comes with a miniature Bible (the complete King James version!) and will recite Scripture verses when her hand is pressed. Catholic Homeschool Barbie™ wears a crucifix, chapel veil, and can lead your children in praying the Rosary (in your choice of Latin or English) when her hands are placed together. Secular Homeschool Barbie™ comes complete with a grain mill and Birkenstocks™, and shares her favorite home remedies & recipes with a pat on the back. All three dolls include a variety of Math curricula with manipulatives and chalkboards with tiny real chalk!